AMJ Auto Service now stock and use BG Products. 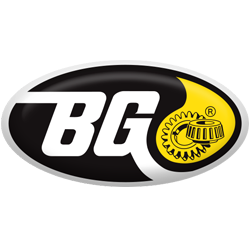 BG Products, Inc., the leading manufacturer and supplier of quality automotive fuel and oil conditioners, speciality chemicals, greases, tools and equipment. Battery – The BG Battery Service prevents corrosion and preserves the battery’s full power for easy, immediate starting. We recommend a BG Battery Service once a year to extend the life and improve reliability of a vehicle’s battery. Brakes – When it comes to safety, brakes are the most important component in a vehicle. BG’s high quality brake products and equipment will ensure quieter brake pads and a safer, longer lasting and more efficient braking system. Climate Control – BG’s line of climate control products and equipment will eliminate odors and control contaminants — bacteria, mold, spores, fungi, and road grime — in vehicle air conditioning and heating systems. Cooling System – Because engine overheating is the leading cause of roadside breakdowns, BG attaches special emphasis to our comprehensive set of cooling system products and tools that ensure reliable performance of vehicle’s cooling system components. Diesel Fuel System – Unmatched in the industry, BG’s line of diesel fuel products and equipment can restore diesel fuel economy or solve nearly any diesel fuel system issue. Drive Line – Heat, moisture, extreme pressure and loads cause gear oil to break down or to be contaminated, leading to lubrication failure and worn drive line gears. Too often overlooked in maintenance programs, drive line products and equipment contribute meaningfully to the overall economy and efficiency of your vehicle’s operation. Engine – High operating temperatures, combined with the increasing regularity of stop-and-go driving, cause rapid depletion of critical oil additives. Without these protective additives, oxidation can reduce oil to heavy, black sludge in the crankcase, oil screens, oil passages, rocker arms and other critical areas of the engine. Used at oil change intervals, BG’s line of engine products will safely and effectively clean and remove deposits and fortify new oil for optimum performance and engine protection. Gasoline Fuel System – BG fuel system cleaners and conditioners will clean fuel injectors, throttle body, plenum and air intake, intake valves and ports and remove combustion chamber deposits. Restoring fuel economy, reduce environmentally damaging exhaust emissions, and restore the fun of like-new drivability to your vehicle. Power Steering – The power steering pump generates extremely high temperatures and pressures that can cause failure without notice. High quality BG power steering fluid will make sure that doesn’t happen. Do you want to know more? Just contact us for details – or to book your car in.